The C-Lon Micro Cord is a bonded 3 ply twisted multi-filament thread with diameter similar to nylon #69 and size E nylon thread. The Micro Cord is great for stitching, wrapping, finishing, hidden construction, and micro-knotting/macrame with a high count of knots per square inches. It is also a great thread for stringing beads, kumihimo or bead crochet with small holes beads (11s, 15s, semi-precious and precious faceted beads). C-Lon Micro Cord can also be used as a a warp or weft thread for loom or for off-loom bead weaving where a twisted thread is desired. The colors match the C-Lon Bead Cord, C-Lon Fine Weight Bead Cord Tex 135 and C-Lon Tex 400 Bead Cord, so it's great for projects that require different sizes of thread in the same color. Personal Note - I use Nylon #69/C-Lon Micro Cord in conjunction with Nylon #18/C-Lon Bead Cord. It is great for stitching, wrapping, finishing and hidden construction. I also occasionally use it to do part of a piece, such as the micro-knotting of a mini cabochon for a very small gemstone with need of a very high count of knots per square inch. It is also a great thread for beading fine beads with small holes such as many of the semi-precious and precious faceted beads out on the market right now. One of my customer made several wallets with beaded panels woven on a loom with nylon #69 about 15 years ago. Her wallets have been in use everyday for over 15 years with no sign of wear! For BK and WH + AM, C, CB, CHO, CO, CT, FG, FX, GP, K, LB, LC, LO, O, OL, PER, PU, RS, S, SG, SI, TL, WN. If a color is sold out and no longer available in the larger spools, we will send you 2 smaller spools. For BK and WH + AB, AM, ARG, BR, C, CB, CHA, CHO, CO, CPR, CT, EGG, FX, G, GM, GO, GR, GY, K, L, LB, LC, MB, N, O, OL, OY, PER, PK, R, RS, S, SE, SILV, SR, SS, TL, TQ, VA. Please double check your color entries. Make sure the colors are listed here on the left. 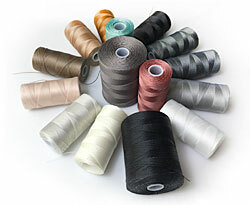 Note - This type of thread was originally designed for heavy industrial sewing, upholstery and other sewing applications that require a strong durable thread. C-Lon Micro Cord is produced for the bead, micro macrame & fiber jewelry world, and is great for many other applications including industrial sewing.